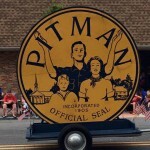 Pitman is governed by an elected Mayor and Council. The Mayor is elected at-large for a four-year term and Council is at-large, three-year terms. All are volunteer positions. The Pitman Grove Area is on the New Jersey and National Registers of Historic Places. It developed from a summer camp meeting at the turn of the century. In the center of the Grove area is the Camp Meeting Auditorium which was built in 1882 and recently renovated by the Borough. This historic building was once the center of Methodist worship. People came from far away for revival meetings at the Auditorium; the first such meeting was held in 1871. There are 12 “avenues”, representing the disciples of Christ, that are joined to the auditorium as spokes on the hub of a wheel. There is a spot in the tabernacle where you can stand and look down all 12 avenues. Eventually small cottages were built on these avenues and this was the origin of the town. In 1905, Pitman Grove became the Borough of Pitman. Back then, Pitman was known as a place with no mosquitoes, no malaria and no saloons. To this day, Pitman is a dry town with no liquor stores and no liquor licenses issued. We do, however, have our fair share of mosquitoes! To preserve the Grove’s uniqueness, an historic district ordinance has been adopted. Before any exterior changes can be made, property owners within the district must obtain a Certificate of Appropriateness from the Building Inspector’s Office in Borough Hall or call 589-2433. The business section of Pitman runs along Broadway. Many stores line both sides of this street. One can find antiques shops, clothing stores, book stores, card and gift shops, convenience stores and more. The Broadway Theater is also located on Broadway; This theater is known for its elaborate architecture, chandeliers and old fashioned balcony and seating boxes. It was built in the early 1920’s. The Pitman Chamber of Commerce is composed of over 120 local businesses.